[Announcement] Your Best Game Ever Will Happen! Your Best Game Ever is not your typical RPG sourcebook. It’s not a book with adventures, spells, creatures, or magic items. It’s not a book for characters at all, but a book for players! If you play or run roleplaying games, this book is for you. Inside this gorgeous hardcover book, suitable for your coffee table or your gaming table, you will find advice and suggestions for enhancing your RPG experience at the table and away from it. This is an insider’s look at everything that goes into the hobby—finding a group, making a character, running a game, creating adventures, finding all the right ideas, hosting a game…and that’s just for starters. You’ve been gaming for a while now. Maybe even years. You get the concepts, and you understand the rules. No one needs to explain the dice to you. 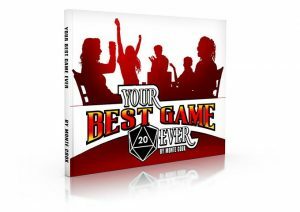 Your Best Game Ever embraces the hobby you love, and provides real tips, immediately usable advice, and hands-on pointers you can use at your game table. You’ll find everything here from enhancing immersion, tips for running games online, creating characters with depth, worldbuilding, designing rules, dealing with personality conflicts that arise at the table, and more! Your friends play RPGs. You’ve maybe watched some streaming games, or given it a try a few times. You get the general idea, but where do you go from there? How do you really get into this hobby the way so many others have? This book will give you everything you need to learn how to choose the right game, how to fit into your game group or start your own group, and get you going on the fast track to being a great gamer. I am pleased to announce that I am one of several consultants on this 2019 project. The Your Best Game Ever! Kickstarter has already funded, and we’re on to stretch goals. Monte Cook is the primary writer on the book. He’s joined by a wealth of talented contributors that includes: Eric Campbell, Matt Colville, Luke Crane, Stacy Dellorfano, Tanya DePass, Ajit George, Jennell Jaquays, Eloy Lasanta, Tom Lommel, Matthew Mercer, Susan J. Morris, Alina Pete, and yours truly.